At the First Glass wine tasting the other night (21 June to be precise) I got the opportunity along with the other 120 or so at the tasting to try the three new ‘Tom’ releases from the Church Road Winery in Hawkes Bay. 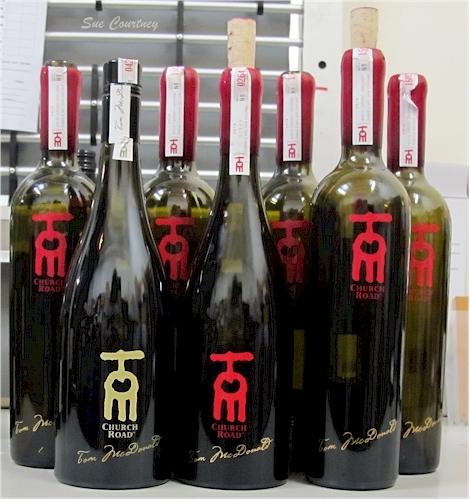 Named for visionary winemaker Tom McDonald (1907-1987) who devoted his life to making wines at the current site of the Church Road winery, the Tom wines are true icons of #nzwine and some of the most expensive too. These are my impressions of the wines (please note First Glass also uses a version of these for their newsletter and website). The savoury oak bouquet of this golden-hued wine has a wonderful leesy, mealy, malty, sizzled butter allure with a haunting floral note wafting through and the taste is concentrated and powerful with a deep, sweet oak frame. It conjures up toasted brioche, fig, creamed nuts, delicate peach and the merest touch of mandarin and the mouth-coating finish is incredibly malty with a lingering spicy zesty vibe and again an evocative floral note that was hinted at on the bouquet. Still such a baby but the potential is clearly there. This inky powerhouse initially has a reticent bouquet that opens up to reveal a delicate fragrance of warm spices, rich plummy fruit, hints of rose spice, tar, liquorice, black forest chocolate and leather – and so much more powerful in the empty glass. Juicy is the first taste impression – juicy plums and cherries over savoury French oak infused with toasted aromatic spices with a hint of liquorice and fine firm tannins with a supple flow. A heady and already harmonious Syrah with port-like alcohol sweetness initially masking the youthfulness and a peppery bite to the long dry finish where the youthfulness is more apparent. I’m not a huge fan of NZ Syrah but this is sensational – if only they were all like this … sigh. Inky purple black with a complex aromatic and cedary bouquet brimming with lifted red fruit and hints of camphor, violet, anise, rose spice and fragrant herbs. The palate is almost ethereal with beautifully fine tannins and a savoury frame with the spicy oak supportive but never intrusive. The blackcurrant and black cherry fruit is concentrated, complex and ripe, there’s a hint of chocolate, a smidgen of mint and other dried herbs, and the creamy finish just seems to float. What is so amazing about the Tom reds is the fragrance – smelling the empty glass of both is very satisfying – but the Syrah especially – not often an empty glass gives so much pleasure..
Amazing wines, nice to taste but sadly out of my budget to buy. This entry was posted in #nzwine, blended reds, chardonnay, hawkes bay, merlot, shiraz syrah and tagged 2014, Church Road, q, Tom by Sue Courtney. Bookmark the permalink.